This article is about the company. For the carbonated beverage, see Coca-Cola. The company's stock is listed on the NYSE (NYSE: KO) and is part of DJIA, the S&P 500 index, the Russell 1000 Index, and the Russell 1000 Growth Stock Index. As of 2015, its chairman and its CEO is Muhtar Kent. The company has a long history of acquisitions. Coca-Cola acquired Minute Maid in 1960, the Indian cola brand Thums Up in 1993, and Barq's in 1995. In 2001, it acquired the Odwalla brand of fruit juices, smoothies, and bars for $181 million. In 2007, it acquired Fuze Beverage from founder Lance Collins and Castanea Partners for an estimated $250 million. The company's 2009 bid to buy a Chinese juice maker ended when China rejected its $2.4 billion bid for the Huiyuan Juice Group, on the grounds the resulting company would be a virtual monopoly. Nationalism was also thought to be a reason for aborting the deal. In 1982, Coca-Cola purchased Columbia Pictures for $692 million. It sold the movie studio to Sony, for $3 billion, in 1989. In 2013, Coca-Cola finalized its purchase of ZICO, a coconut water company. In 2015, the company took a minority stake ownership in the cold pressed juice manufacturer, Suja Life LLC. According to The Coca-Cola Company's 2005 Annual Report, the firm sells beverage products in more than 200 countries. The report further states that of the more than 50 billion beverage servings of all types consumed worldwide, daily, beverages bearing the trademarks owned by or licensed to Coca-Cola account for approximately 1.5 billion (the latest figure in 2010 shows that now they serve 1.6 billion drinks every day). Of these, beverages bearing the trademark "Coca-Cola" or "Coke" accounted for approximately 78% of the company's total gallon sales. In 2010, it was announced that Coca-Cola had become the first brand to top £1 billion in annual UK grocery sales. Since 1920, Coca-Cola has been a publicly traded company. One share of stock purchased in 1919 for $40, with all dividends reinvested, would be worth $9.8 million in 2012, a 10.7% annual increase, adjusted for inflation. In 1987, Coca-Cola once again became one of the 30 stocks which makes up the Dow Jones Industrial Average, which is commonly referenced as a proxy for stock market performance; it had previously been a Dow stock from 1932 to 1935. Coca-Cola has paid a dividend, increasing each year for 49 years. Stock is available from a direct purchase program, through Computershare Trust Company, but unlike many programs, has investment fees. In general, The Coca-Cola Company and its subsidiaries only produce syrup concentrate, which is then sold to various bottlers throughout the world who hold a local Coca-Cola franchise. Coca-Cola bottlers, who hold territorially exclusive contracts with the company, produce the finished product in cans and bottles from the concentrate in combination with filtered water and sweeteners. The bottlers then sell, distribute, and merchandise the resulting Coca-Cola product to retail stores, vending machines, restaurants, and food service distributors. Outside the United States, the bottlers also control the fountain business. Since the early 1980s, the company has actively encouraged the consolidation of bottlers, with the company often owning a share of these "anchor bottlers". In the United States, the company bypasses bottlers and is responsible for the manufacture and sale of fountain syrups directly to authorized fountain wholesalers and some fountain retailers. After purchasing the North American assets of Coca-Cola Enterprises, as of 2014 the company directly owns 100% of Coca-Cola Refreshments, the anchor bottler of Coca-Cola products in North America, representing about 90% of Canada and 80% of the United States. In September 2015, the company announced the sale of several production plants and territories to Swire, Consolidated, and United, and creation of the Coca-Cola National Product Supply System which controls 95% of the territory in the United States. After Martin Luther King, Jr. won the 1964 Nobel Peace Prize, plans for an interracial celebratory dinner in still-segregated Atlanta were not initially well supported by the city's business elite until Coca-Cola intervened. 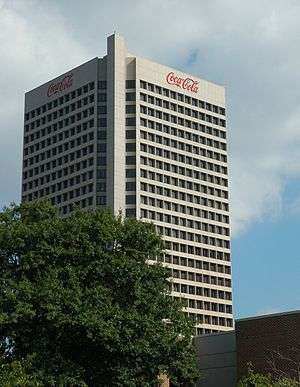 J. Paul Austin, the chairman and CEO of Coca-Cola, and Mayor Ivan Allen summoned key Atlanta business leaders to the Commerce Club's eighteenth floor dining room, where Austin told them flatly, 'It is embarrassing for Coca-Cola to be located in a city that refuses to honor its Nobel Prize winner. We are an international business. The Coca-Cola Company does not need Atlanta. You all need to decide whether Atlanta needs the Coca-Cola Company.' Within two hours of the end of that meeting, every ticket to the dinner was sold. Throughout 2012, Coca-Cola contributed $1,700,500 to a $46 million political campaign known as "The Coalition Against The Costly Food Labeling Proposition, sponsored by Farmers and Food Producers". This organization was set up to oppose a citizen's initiative, known as Proposition 37, demanding mandatory labeling of foods containing genetically modified ingredients. 1996–2002 Chevrolet Express wagon from The Coca-Cola Company. 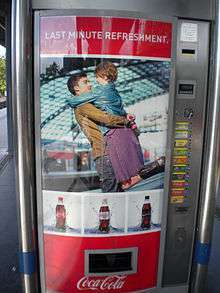 Coca Cola advertising has "been among the most prolific in marketing history", with a notable and major impact on popular culture and society as a whole. The logo, bottle design, and brand image are internationally recognisable. Their product is ranked the number one soft drink, repeatedly, internationally, and has notoriety as the first soft drink consumed by astronauts in space. They employ a diverse range of integrated marketing communications to advertise through direct marketing, web based media, social media and sales promotions (Stringer, 2015). The company carefully considers all touch points a consumer (or prospective consumer) has with the brand as potential delivery channels for the brand's message, and makes use of all relevant communication systems. This well established, long standing, consistent approach has created a longing for the product that by far "superseded the desire for that typically associated with a drink to quench one's thirst" (Dudovskiy, 2015). They have exclusive vendor company partnerships, which eliminates competition, e.g. cinemas and restaurants only serving Coca Cola over Pepsi. At sponsored sporting events they again eliminate competition by attaining sole sale rights as well as VIP sales opportunities to important clients, e.g., baseball fields. The company also markets via mobile marketing in text messages, e.g.. viral marketing campaigns (Stringer, 2015). They set the industry benchmark as the brand so universally recognized that audience building is unnecessary. Their fan engagement spans 86 million globally across social media channels. They deliver a consistently unified message whether it be through new products, online interaction, and social, cultural or sporting events (Stringer, 2015). In the retail setting, direct store beverage delivery trucks (mobile advertising) as well as point of sale coolers and vending machines have bright red logo blazoned branding. In terms of food service, Coca Cola is a food pairing suggestion that is now ingrained as a food match, e.g., for popcorn, burgers, fries, and hot dog combos (Stringer, 2015). The Coca-Cola Company offers more than 350 brands in over 200 countries, aside from its namesake Coca-Cola beverage. Tab was Coca-Cola's first attempt to develop a diet soft drink, using saccharin as a sugar substitute. Introduced in 1963, the product is still sold today, although its sales have dwindled since the introduction of Diet Coke. The Tab soft drink is difficult to locate in recent times, due to its de facto replacement by Diet Coke. The Coca-Cola Company also produces a number of other soft drinks including Fanta (introduced circa 1941) and Sprite. Fanta's origins date back to World War II during a trade embargo against Germany on cola syrup, making it impossible to sell Coca-Cola in Germany. Max Keith, the head of Coca-Cola's German office during the war, decided to create a new product for the German market, made from products only available in Germany at the time, which they named Fanta. The drink proved to be a hit, and when Coke took over again after the war, it adopted the Fanta brand as well. Fanta was originally an orange flavored soft drink which can come in plastic bottles or cans. It has become available in many different flavors now such as grape, peach, grapefruit, apple, pineapple and strawberry. In 1961, Coca-Cola introduced Sprite, a lemon-lime soft drink, and another of the company's bestsellers and its response to 7 Up. An ad in Berlin, Germany. Coca-Cola South Africa also released Valpre Bottled "still" and "sparkling" water. Coca-Cola bought Columbia Pictures in 1981 owing to the low monetary value of the studio. The film company was the first and only studio ever owned by Coca-Cola. During its ownership of the studio, the studio released many popular films including Ghostbusters, Stripes, The Karate Kid, and some others. However, after the 1987 film Ishtar, Columbia was sold to Tokyo-based Sony. No longer manufactured, the Coca-Cola BreakMate was a three-flavour dispenser introduced by Coca-Cola and Siemens in 1988. Intended for use in offices with five to fifty people, its refrigerated compartment held three individual one-litre plastic containers of soda syrup and a CO2 tank. Like a soda fountain, it mixed syrup in a 1:5 ratio with carbonated water. In North America, Coca-Cola discontinued spare BreakMate parts in 2007 and stopped distributing the syrup in 2010. During the 1990s, the company responded to the growing consumer interest in healthy beverages by introducing several new non-carbonated beverage brands. These included Minute Maid Juices to Go, Powerade sports beverage, flavored tea Nestea (in a joint venture with Nestle), Fruitopia fruit drink and Dasani water, among others. In 2001, Minute Maid division launched the Simply Orange brand of juices including orange juice. 2016, Coca-Cola India introduced Vio (flavoured milk) to enter into the value added dairy category, the product lays the foundation for Coca-Cola's new segment after Carbonated beverages, Water and Juices. In 2004, perhaps in response to the burgeoning popularity of low-carbohydrate diets such as the Atkins diet, Coca-Cola announced its intention to develop and sell a low-carbohydrate alternative to Coke Classic, dubbed C2 Cola. C2 contains a mix of high fructose corn syrup, aspartame, sucralose, and Acesulfame potassium. C2 is designed to more closely emulate the taste of Coca-Cola Classic. Even with less than half of the food energy and carbohydrates of standard soft drinks, C2 is not a replacement for zero-calorie soft drinks such as Diet Coke. C2 went on sale in the U.S. on June 11, 2004, and in Canada in August 2004. C2's future is uncertain due to disappointing sales. Starting in 2009, The Coca-Cola Company invested in Innocent Drinks, first with a minor stake, increasing to 90% in the first quarter of 2013. 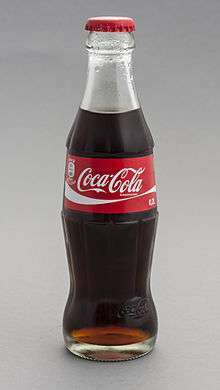 Coca-Cola is the best-selling soft drink in most countries, and was recognized as the number one global brand in 2010. While the Middle East is one of the only regions in the world where Coca-Cola is not the number one soda drink, Coca-Cola nonetheless holds almost 25% marketshare (to Pepsi's 75%) and had double-digit growth in 2003. Similarly, in Scotland, where the locally produced Irn-Bru was once more popular, 2005 figures show that both Coca-Cola and Diet Coke now outsell Irn-Bru. In Peru, the native Inca Kola has been more popular than Coca-Cola, which prompted Coca-Cola to enter in negotiations with the soft drink's company and buy 50% of its stakes. In Japan, the best selling soft drink is not cola, as (canned) tea and coffee are more popular. As such, The Coca-Cola Company's best selling brand there is not Coca-Cola, but Georgia. As of May 2016, The Coca-Cola Company has temporally ceased production of its signature drink in Venezuela due to sugar shortages. On July 6, 2006, a Coca-Cola employee and two other people were arrested and charged with trying to sell trade secrets information to the soft drink maker's competitor, PepsiCo for $1.5 million. The recipe for Coca-Cola, perhaps the company's most closely guarded secret, was never in jeopardy. Instead, the information was related to a new beverage in development. Coca-Cola executives verified that the documents were valid and proprietary. At least one glass vial containing a sample of a new drink was offered for sale, court documents said. The conspiracy was revealed by PepsiCo, which notified the authorities when they were approached by the conspirators. The company announced a new "negative calorie" green tea drink, Enviga, in 2006, along with trying coffee retail concepts Far Coast and Chaqwa. On May 25, 2007, Coca-Cola announced it would purchase Glaceau, a maker of flavored vitamin-enhanced drinks (vitamin water), flavored waters, and Burn energy drinks, for $4.1 billion in cash. On September 3, 2008, Coca-Cola announced its intention to make cash offers to purchase China Huiyuan Juice Group Limited (which has a 42% share of the Chinese pure fruit juice market) for US$2.4bn (HK$12.20 per share). China's ministry of commerce blocked the deal on March 18, 2009, arguing that the deal would hurt small local juice companies, could have pushed up juice market prices and limited consumers' choices. In October 2009, Coca-Cola revealed its new 90-calorie mini can that holds 7.5 fluid ounces. The mini can is often sold in 8 packs. Despite costing nearly 30 percent more per ounce, the mini cans have been met with positive sales figures. In November 2011, Coca-Cola revealed a seasonal design for their regular Coke cans as part of a partnership with the World Wildlife Fund. However it was withdrawn only a month after release due to consumer complaints about the similar look to the silver cans commonly used for Diet Coke. There were also complaints about deviating from traditional red as the color of Coca-Cola cans previously. Coca-Cola operates a soft drink themed tourist attraction in downtown Atlanta, Ga; the "World of Coca-Cola" is a multi-storied exhibition of the many flavors sold by the company as well as a museum to the history of the company. It was announced on August 14, 2014, that Coca-Cola Co is making a cash payment of $2.15 billion for a 16.7 percent stake in Monster Beverage Corp to expand its market for energy drinks. Coke's ownership in Full Throttle and Burn will be transferred to Monster. In return, Monster will transfer its ownership in Hansen's Natural Sodas and Peace Iced Tea to Coke. Muhtar Kent, Coke's Chief Executive Officer, stated that the company has the option to increase its stake to 25 percent but cannot exceed that percentage in the next four years. Coca-Cola's advertising expenses accounted for US$3.256 billion in 2011. Coca-Cola sponsored the English Football League from the beginning of the 2004–05 season (beginning August 2004) to the start of 2010/11 season, when the Football League replaced it with NPower. Along with this, Coca-Cola sponsored the Coca-Cola Football Camp, that took place in Pretoria, South Africa during the 2010 FIFA World Cup, during which hundreds of teenagers from around the world were able to come together and share their love of the game, partly due to Best Buy's efforts through their @15 program. Other major sponsorships include NHRA, NASCAR, the PGA Tour, NCAA Championships, the Olympic Games, the NRL, the FIFA World Cups and the UEFA European Championships. Each Fall, Coca-Cola is the sponsor of the TOUR Championship by Coca-Cola held at East Lake Golf Club in Atlanta, GA. The TOUR Championship is the season ending tournament of the PGA TOUR. In the Philippines, it has a team in the Philippine Basketball Association, the Powerade Tigers. The company sponsored the hit Fox singing-competition series American Idol. Coca-Cola is a sponsor of the nightly talk show on PBS, Charlie Rose in the US. While not necessarily having naming rights to anything in all locations, the company does sponsor and provide beverages in many theme parks, usually in an exclusive capacity. This includes the Walt Disney Parks and Resorts, Merlin Entertainment, Universal Parks & Resorts, Six Flags, Cedar Fair, and SeaWorld Entertainment which are six of the nine largest theme park operators worldwide (it is unknown whether OCT Parks China, the Chimelong Group, or Fantawild, the fourth, seventh, and eighth largest theme park operators respectively, use Coca-Cola). The company also directly sponsors, with naming rights, the Coca-Cola London Eye and the Coca-Cola Orlando Eye. The company also operates "Coca-Cola" visitor centers in Israel and Turkey. 1 2 3 4 5 6 "2015 annual results". The Coca-Cola Co.
↑ "The Coca-Cola Brands". coca-colacompany.com. Retrieved December 19, 2012. ↑ "Who Invented Coca Cola?". Whoinventedit.net. Retrieved November 2, 2012. ↑ "History of The Minute Maid Company". Fundinguniverse.com. Retrieved July 29, 2012. ↑ "Strong Cola Taste, Macho Personality". Archived from the original on February 26, 2009. ↑ Barq's Root Beer: History, Coca-Cola, retrieved January 2, 2013. ↑ "Coca Cola, Form SC TO-T, Filing Date Oct 30, 2001". secdatabase.com. Retrieved March 27, 2013. ↑ "Coke Buys Odwalla". (October 30, 2001).CNN Money. ↑ "Coca Cola, Form 10-K, Annual Report, Filing Date Feb 21, 2007" (PDF). secdatabase.com. Retrieved March 27, 2013. ↑ "Coca-Cola Buys Fuze Beverage". (February 12, 2007) Boulder Daily Camera. ↑ "Coca Cola, Form 10-Q, Quarterly Report, Filing Date Apr 30, 2009". secdatabase.com. Retrieved March 27, 2013. ↑ "Coke's China juice move collapses". BBC News. March 18, 2009. Retrieved May 25, 2010. ↑ Sellers, Patricia; Woods, Wilton (October 13, 1997). "WHERE COKE GOES FROM HERE". Fortune. Retrieved October 10, 2011. ↑ "Coke Finishes Buyout of Zico; Uzzell Becomes President, Rampolla to Advise - BevNET.com". BevNET.com. Retrieved March 8, 2016. ↑ "Coca-Cola all in on coconut water maker". Retrieved March 8, 2016. ↑ "ZICO™ Beverages Joins The Coca-Cola Family". The Coca-Cola Company. Retrieved March 8, 2016. ↑ Esterl, Mike. "Coca-Cola Buys Minority Stake in Suja Life". Wall Street Journal. ISSN 0099-9660. Retrieved March 8, 2016. ↑ "Organic Juice Startup Suja Adds Unlikely Partners: Coca-Cola, Goldman Sachs". Forbes. Retrieved March 8, 2016. ↑ "Coca Cola Company Form 10-K 2005". SEC. Retrieved May 11, 2006. ↑ "Coke sales first to top £1bn". Edinburgh Evening News. March 19, 2010. Retrieved March 20, 2010. ↑ Wiederman, Adam J. (August 14, 2012). "One Share of Stock Now Worth $9.8 Million -- Is It Really Possible?". DailyFinance.com. ↑ "Decades of Great Performance From 9 Dow Stocks". DailyFinance.com. November 5, 2011. ↑ "Dividends". The Coca-Cola Company. ↑ "Coca-Cola shareholders OK 2-for-1 stock split". USATODAY.COM. ↑ "Coca Cola (KO) DRIP". ↑ Harris, Rosemary. "From humble beginnings". Brent Wheeler Group Limited. Retrieved 10 August 2016. ↑ "THE COCA-COLA COMPANY at a Glance". The Vault. Retrieved 10 August 2016. ↑ Kossovsky, Nir (2012). Reputation, Stock Price, and You. Apress. p. 108. Retrieved 10 August 2016. ↑ Zacks Investment Research (December 7, 2015). "Coca-Cola (KO) to Sell 9 US Plants to Independent Bottlers". Zacks Investment Research. ↑ "NOBEL PEACE PRIZE: In 1964, award to King stirred a storm". Atlanta Journal-Constitution. December 10, 2002. ↑ Andrew Young (1996). An Easy Burden. HarperCollins. ISBN 978-0-06-092890-2. OCLC 34782719. ↑ Who's Funding Prop 37, Labeling for Genetically Engineered Foods? | Propositions | Elections 2012. KCET. Retrieved on December 23, 2013. ↑ Westervelt, Amy (August 22, 2012). "Monsanto, DuPont Spending Millions to Oppose California's GMO Labeling Law". Forbes. Retrieved 10 August 2016. 1 2 3 4 Stringer, G. (2015). Case Study: Coca Cola Integrated Marketing Communications. ↑ Dudovskiy, J. (2015). "Coca-Cola Marketing Communications: A Critical Analysis". Research Methodology. Retrieved March 1, 2015. ↑ Estes, Adam. "A Brief History of Racist Soft Drinks". The Wire. Retrieved 10 August 2016. ↑ Mikkelson, Barbara (April 29, 2011). "The Reich Stuff?". Snopes. Retrieved May 8, 2014. ↑ "Coca-Cola seeping into coffee breaks". Eugene Register-Guard. November 19, 1988. ↑ "Coca Cola Refreshments Discontinues BreakMate Syrup". VendingMarketWatch. Retrieved September 21, 2014. ↑ "Coca-Cola India Enters Dairy Market With VIO Flavored Milk". The Coca-Cola Company. Retrieved June 22, 2016. ↑ "Best Global Brands Ranking for 2010". Interbrand.com. Retrieved July 29, 2012. ↑ "Coke and Pepsi battle it out". AME Info. April 8, 2004. Retrieved May 11, 2006. ↑ Terry Murden (January 30, 2005). "Coke adds life to health drinks sector". The Scotsman. Scotland On Sunday. UK. Retrieved May 11, 2006. ↑ Coca-Cola West Japan IR report (in Japanese), 2008. ↑ Day, Kathleen (July 6, 2006). "3 Accused In Theft Of Coke Secrets". The Washington Post. Retrieved July 15, 2006. ↑ Stanford, Duane (May 25, 2007). "Coke to buy Glaceau in $4 billion deal". Atlanta Journal-Constitution. Archived from the original on May 27, 2007. Retrieved May 25, 2007. ↑ Tucker, Sundeep (March 17, 2009). "Coca-Cola's $2.4bn China deal at risk". Financial Times. Hong Kong. Retrieved March 17, 2009. ↑ "THE COCA-COLA COMPANY Media Center". ↑ Tucker, Sundeep (March 18, 2009). "China blocks Coca-Cola bid for Huiyuan". Financial Times. Hong Kong. Retrieved March 18, 2009. ↑ Plumb, Tierney (October 14, 2009). "Coca-Cola to unveil mini cans in D.C.". Washington Business Journal/Bizjournals.com. ↑ Tuttle, Brad. "How Coke Convinced Us to Pay More … for Less Soda". MONEY.com. Retrieved October 5, 2015. ↑ Esterl, Mike (December 1, 2011). "A Frosty Reception for Coca-Cola's White Christmas Cans". The Wall Street Journal. ↑ ATHAVALEY, ANJALI (August 15, 2014). "Coca-Cola pays $2.2 billion for major stake in Monster Beverage". Reuters. Retrieved August 15, 2014. ↑ Gelles, David (August 14, 2014). "Coke to Buy Stake in Monster Beverage for $2.15 Billion". The New York Times. Retrieved August 15, 2014. ↑ "Teens Gear up for Soccer in South Africa". NewsBlaze.com. Retrieved June 29, 2011. ↑ "About the program". Charlie Rose. Retrieved July 29, 2012. ↑ "TEA/AECOM 2015 Global Attractions Attendance Report" (PDF). Themed Entertainment Association. 2015. Retrieved May 25, 2016. ↑ "Orlando Eye is renamed the Coca-Cola Orlando Eye". 28 July 2016. Retrieved 28 July 2016. ↑ Dineen, Caitlin. "Orlando Eye officially flies Coca-Cola banner". Orlando Sentinel. Retrieved 28 July 2016. ↑ "Interview about the attractions park for Coca-Cola Turkey". cafe.themarker.com. ↑ "Coca-Cola Visitors Centre Turkey". mefik.co.il. Wikimedia Commons has media related to The Coca-Cola Company.